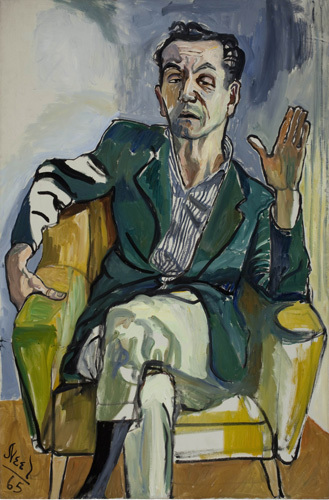 Alice Neel, Frank Gentile, 1965, oil on canvas, 48 x 32 1/8”. Courtesy of the Estate of Alice Neel. Art history’s view of women artists, on the one hand, and the more recent phenomenon of digital technology, on the other, have proven to be double-edged swords for Alice Neel. As the well-worn story goes, she was a figurative painter and a woman at a time when neither was fashionable for an artist; but today, for the most part, the fact of an artist’s gender (or ethnicity) no longer defines her work in critical dialogue and reception. This intimate exhibition, running concurrently with a traveling retrospective that opens this month at the Museum of Fine Arts, Houston, offers the chance to see sixteen of Neel’s paintings in person, rather than shrunk to fit a book or screen, and the results are wittier and more vibrant than digital reproductions—or her famously anxiety-ridden biography—would suggest. Though Neel achieved success later in life, it was small relative to her peers; this show is only her second exhibition on the West Coast. In this contemporary context, Neel’s work stands out as brash, alive, and refreshingly blunt. Powerful brushstrokes animate sinuous lines that in turn define posture and personality. The sense that the internal states of both sitter and artist merge into a kind of hybrid persona jumps from each canvas. Backgrounds blur casually into obscurity, as if afterthoughts, and color leaps and seeps in paintings suffused with equal parts humor, anxiety, and a love of the whole process—sitting and talking and painting.